← Coastal flood forecasting in Scotland: what’s new? In May we started a project to develop a pilot surface water alerting tool to use during the Commonwealth Games and to help inform our future plans for surface water flood forecasting in the SFFS. The first review stage of the project is now complete so it seemed a good time to provide an update on our progress. 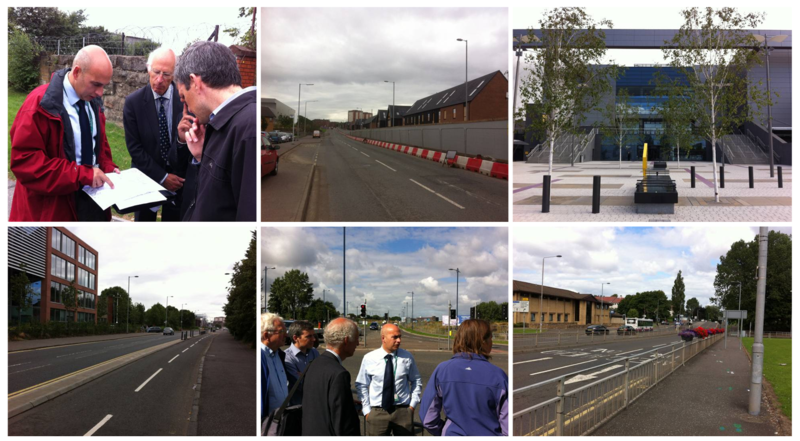 In August members of the project team went on a site visit to look at the known flood risk hot spots in the East End of Glasgow and the vulnerable transport links for the Commonwealth Games. Thanks go to David Russell from Glasgow City Council for leading the day and sharing his detailed knowledge of the area with us. A steering group has been set up of representatives from key responders (see previous blog post for details). This group has met twice and has provided valuable insight into the end user requirements including discussion around the most useful lead time; the time that any surface water alerting product needs to be received by to be useful; and the format and amount of information that the end product should include. The steering group also provides an excellent opportunity to share new science with end users. The project science team have produced three review reports. A Met Office report; “Review of the current status of forecasting intense rainfall likely to cause surface water flooding in Scotland”, and a joint JHI and CEH report; “Review of surface water flood modelling and forecasting for urban communities”. The key findings and recommendations from these in-depth reports are outlined in a summary report available here. 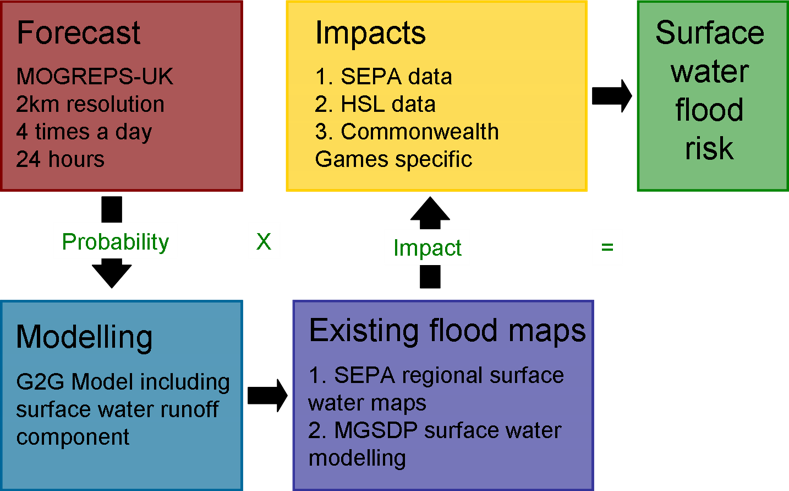 Based on the outputs from the project reports and the steering group we hope to combine the state of the art probabilistic forecasting from the Met Office MOGREPS-UK ensemble with the proven real time surface water runoff modelling capabilities of the Grid-to-Grid model. This will then be linked to existing flood hazard maps and impact assessments to inform a daily surface water risk assessment for Glasgow. A summary of the methodology is shown below. Combining all of these elements in a real time forecasting system is new. No one else is currently doing this therefore we have an exciting but challenging few months ahead to prepare the pilot model for use during the 2014 Commonwealth Games in Glasgow. This entry was posted in Flood, Forecasting, G2G, Research, Surface Water, Weather prediction. Bookmark the permalink.